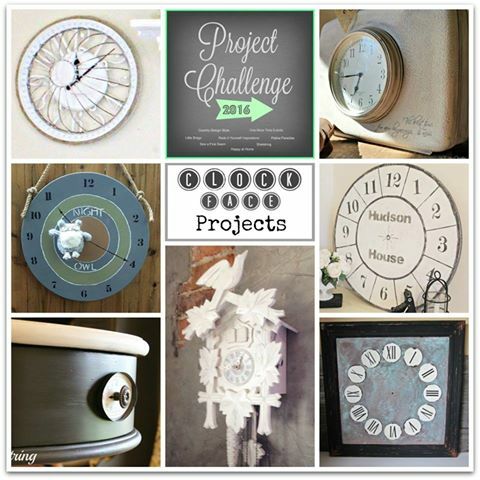 It’s Project Challenge time again and this month our category is clock faces. Yes, I suggested this category. 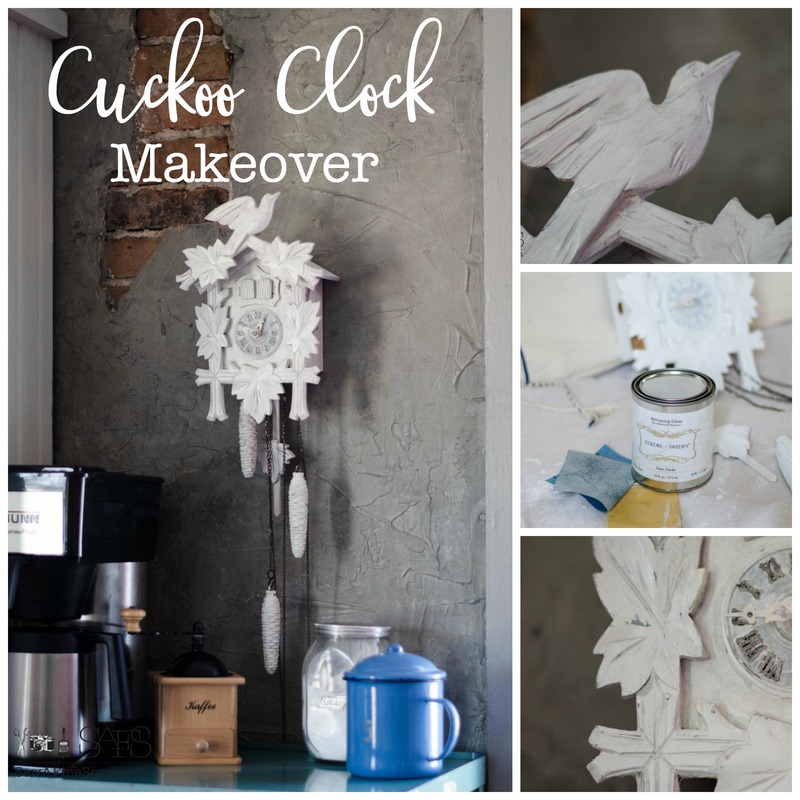 No, I wasn’t planning this makeover when I suggested clock faces as a category. Yes, I am glad I did this makeover. Yes, this challenge is what got me to pull out this clock and get it done! No, I am not one bit sorry I painted it. No, the clock does not currently work. Yes, I plan to see if it can be fixed. Yes, I’m crossing my fingers that it can be made operational again. 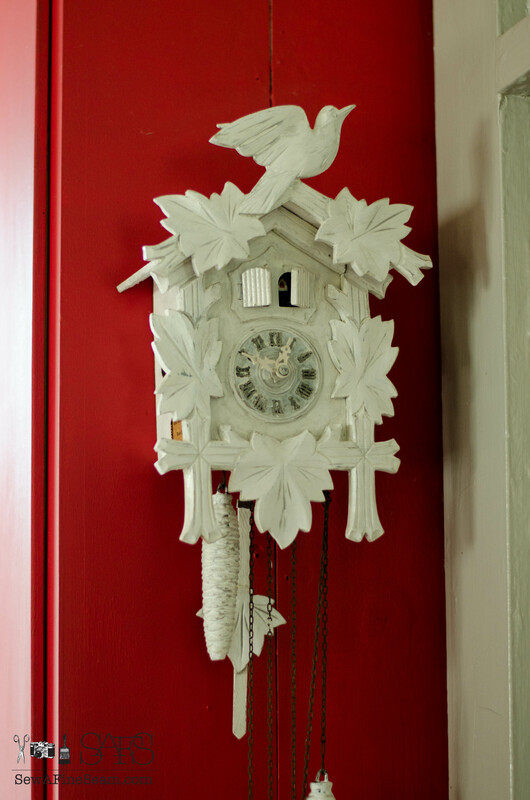 This clock hung in my paternal Grandma’s house, in her hallway. The door from the living room framed the clock and I do think I remember a time when it worked. Or maybe I just think I remember that. 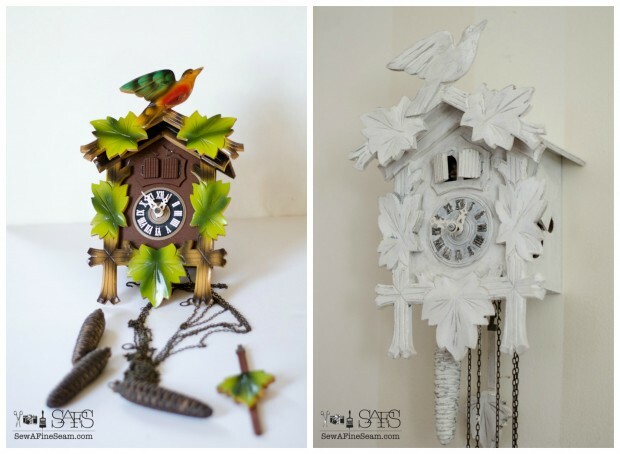 Cuckoo clocks have always fascinated me. Especially when they strike the hour. 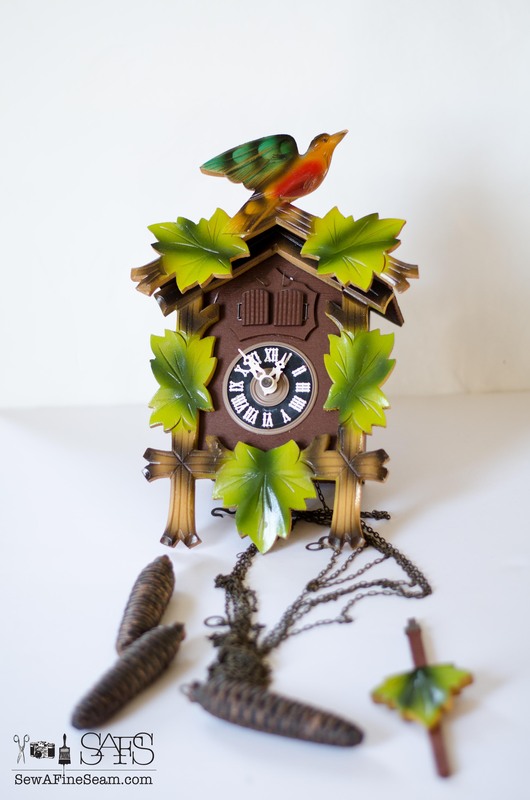 It’s just so cool how that bird pops out to announce the hour and then the little fiddler plays a tune. 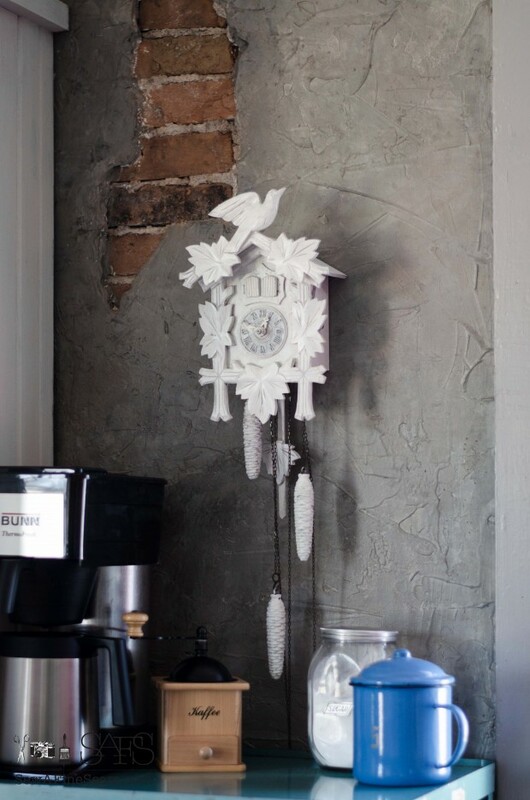 When we went through my Grandma’s things last year, no one else wanted the cuckoo clock. You guessed it – it landed on my pile. I’m sure this was one of hundreds of clocks just like this and I’m sure it was very inexpensive. 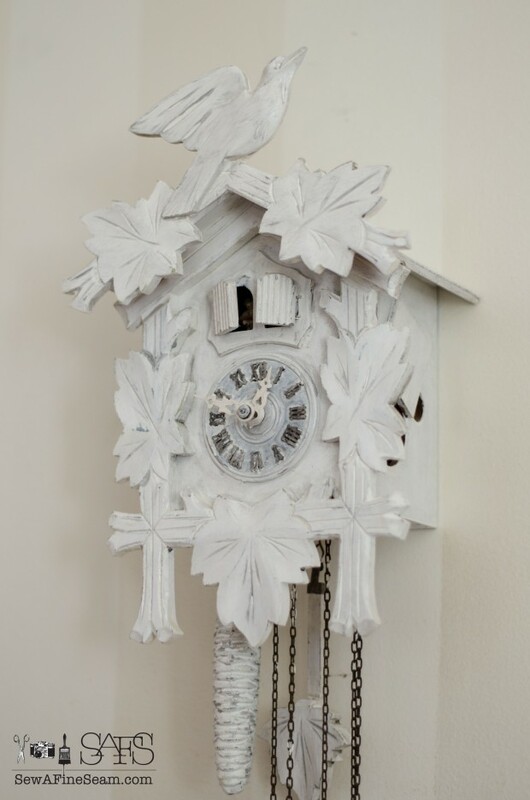 My grandparents were extremely frugal and would not have spent much on a clock. I dismantled as much of it as possible to make the painting process easier. One coat of paint on the left. Two coats of paint in the middle. A bit of distressing with sand paper on the right. 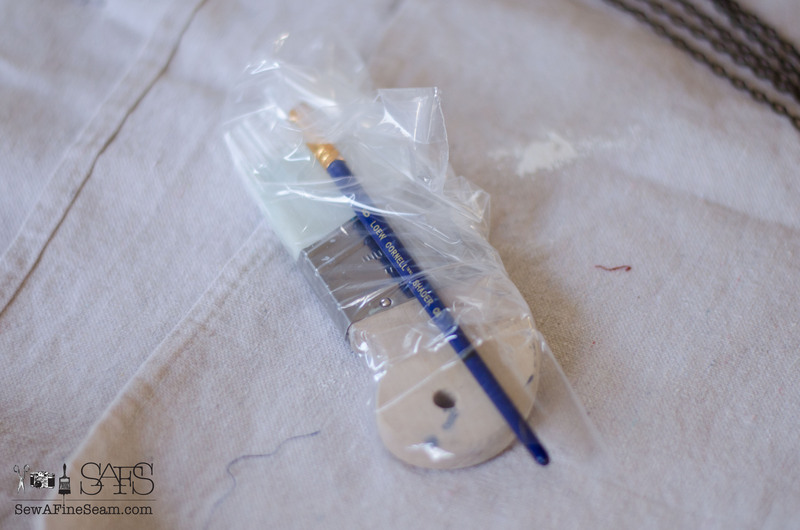 TIP: Use a plastic baggie to store your brush between coats of paint – wrap the plastic snugly around the brush handle to keep the air out. This keeps the brush from drying out while you are waiting on the paint to dry so you can go back and give it another coat. I used the larger brush on the sides and top of the clock and as much of the front as I could. The artist brushes worked very well to get the areas that were tucked into and under the fancy detail work on the front. 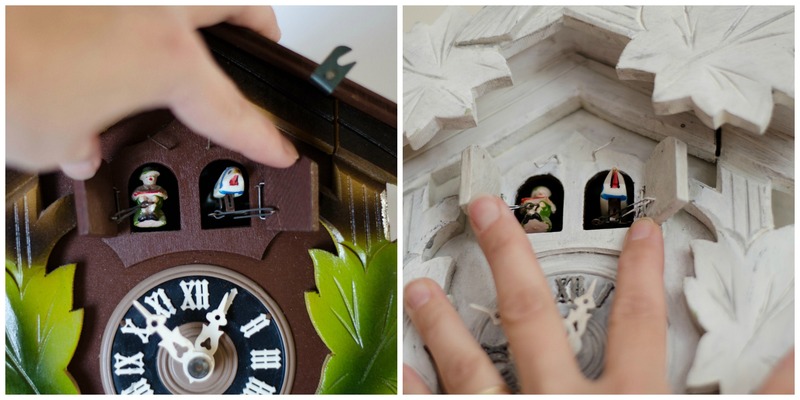 I ended up painting the clock face and hands too. After painting and distressing I decided I wanted more contrast so I pulled out some glaze in Sheer Smoke color. This glaze is made by the same company as the Paint Couture paint I use and sell. 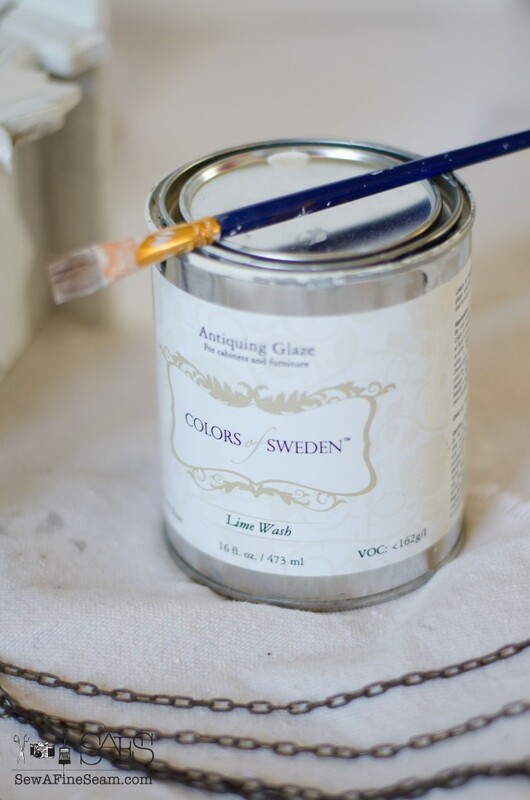 This line is called Colors of Sweden and is all about creating authentic Swedish finishes on furniture. I sell this stuff too! 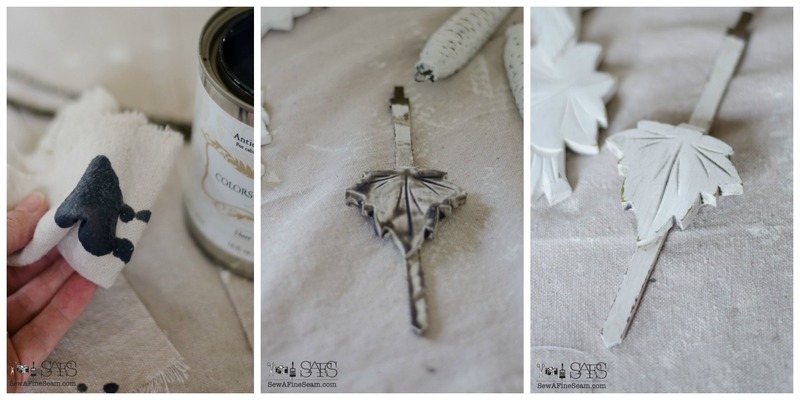 First thing to remember about glazes – Glaze goes on, Glaze comes off. Use a rag, dip in the glaze, smear glaze all over the piece you are working on. It will not be pretty – it’s not supposed to be pretty at this point. For larger pieces I would work in sections but for these detail pieces I did the whole thing. Glaze has a longer open time than topcoats, meaning it will stay wet and workable long enough to achieve the look you want. Using a clean rag, I wiped the glaze back off, leaving it in the creases and in areas I wanted to highlight. After the dark glaze was dry I went back over the whole clock with a light application of glaze in Lime Wash. This not only made the dark glaze a bit more muted but since I brushed it over the whole clock it will also act as the finish for this piece too. 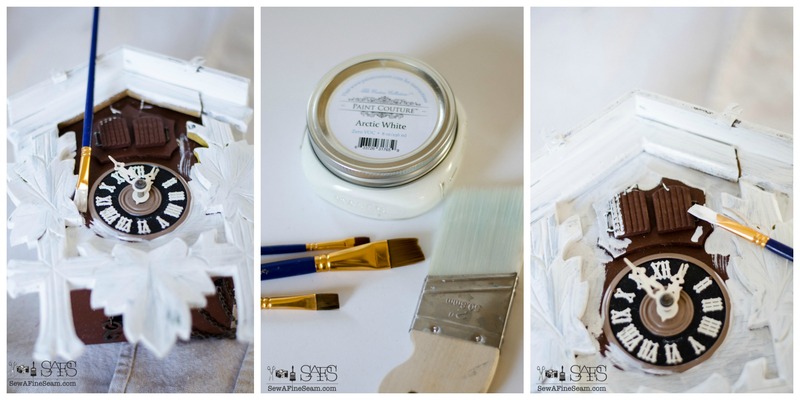 No need to add a topcoat – these glazes will work as the final finish on pieces that will not see a lot of wear and tear. Now this piece fits in with my style and the rest of my home. I’m thrilled with it – paint is amazing! Since it didn’t show up great on my white walls I tried it against my red cupboard in the kitchen. Because there was already a nail there. My favorite spot for it though, ended up being on my grey kitchen wall above the coffee station. In fact it’s still hanging there as I type this. If it does indeed get fixed and works again someday I will have to move it. There isn’t room here for the weights to move all the way down as the clock runs down. I made sure not to get any paint on the bird or the fiddler. 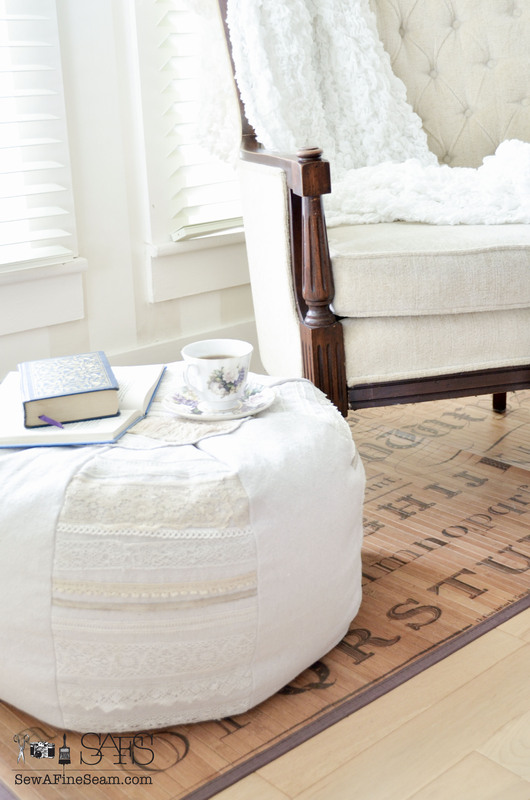 They are totally cute in all their vintage glory and I like them just like they are. No makeover is really complete without a side-by-side before and after, right? Well, here ya go – before and after of a cuckoo clock makeover! Ok, I think that about wraps things up for my clock face challenge. I hope you enjoyed it a bit, even if you are the type that cringes when we DIYers paint everything! Make sure you go see what my friends did for THEIR clock face projects! This was a super fun category – everyone did awesome. I love it painted! The double doors are fascinating. Hope you do get it to work again; it’s a nice heirloom! Thanks Robin, I’m crossing my fingers it can be fixed! I took a trip recently to Germany and the expensive clocks are not the painted ones. This one looks so good redone. You really did it a favor!!! Thank you Melissa!! It was a fun simple project and I love how it turned out!! Thank you so much – you made my day! I love how this turned out and it’s so nice to know others agree!! I know right?!! I was afraid ppl would have a fit because it actually looks better in my before shot than it looks in real life! So much better painted though!! 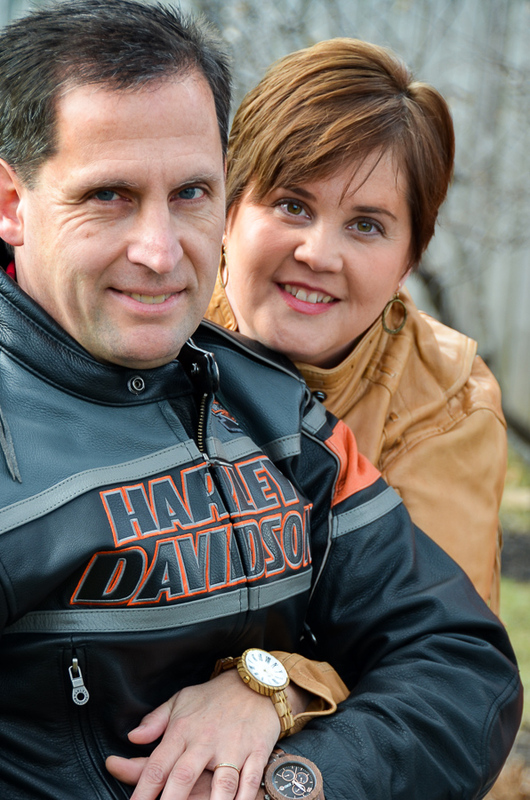 Thank you Tammy – I love how it turned out!! 🙂 painted is almost always better in my opinion! Some ppl like oak some maple etc – I like PAINTED! LOL! 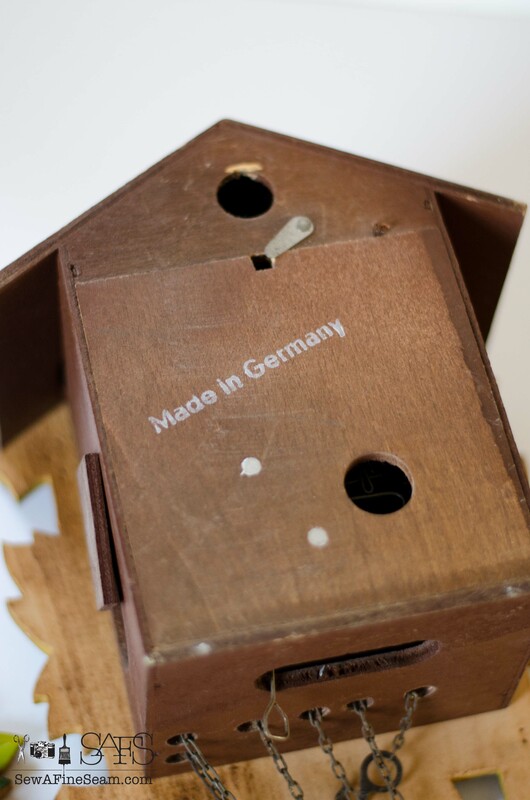 Thanks again my friend for another great project challenge – your idea is super super cool! I have a larger one that a cousin gave me. It was missing parts, so we never hung it. I plan to paint it white and hang it someday. I saw one years ago painted white and loved it. I love it painted and I think it will be cool as a decor piece even if it can’t be fixed to work. It is so pretty painted!! It is very neat in your kitchen. 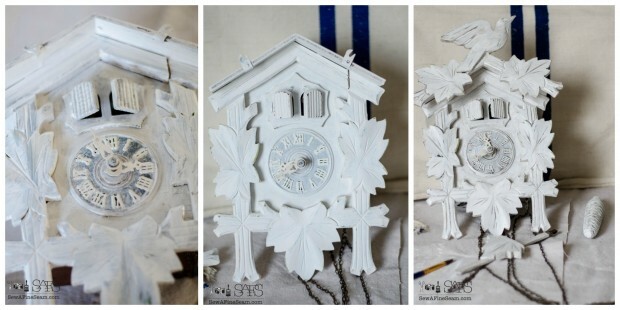 This is a GREAT improvement – it wasn’t an attractive clock in its original state – inexpensive or not!